I can’t believe I haven’t shared my favorite muffin recipe with you yet! These pumpkin chocolate chip mini muffins are a Thanksgiving tradition in our home, It’s the very first thing that goes into my oven early Thanksgiving morning and the last thing that everyone is nibbling on at the end of the day. For years I made these muffins without chocolate chips. Then one time I got a little crazy and threw some in about half the batter. For a few years after that I continued making half and half until finally someone stated the obvious- why even bother with the plain pumpkin muffins? And now we munch on pumpkin chocolate chips mini muffins all day. You seriously might have trouble walking by them without popping one in your mouth. Mostly I am excited to share this recipe here with you because that means I won’t lose it. I seriously cannot be trusted with a piece of paper. I swear I have this recipe copied and printed in 30 places in my home because of the one year I had to completely tear apart my kitchen to find the recipe. This recipe originally made 2 loaves of bread and has been adapted into muffins and then mini muffins. As I said, our family enjoys munching on these throughout Thanksgiving day. It make 10 dozen mini muffins-that’s a lot! I have tried halving the recipe before and was just not completely satisfied with the results. Moist pumpkin muffins studded with dark chocolate chips. Pumpkin chocolate chip muffins are a Thanksgiving tradition you'll come back to again and again! Add eggs, pumpkin, sugar, oil, water, and vanilla in the bowl of your mixer on low speed for 30 seconds. In a separate bowl combine dry ingredients. Add flour mixture to pumpkin mixture until combined. Spray a mini muffin tin with nonstick cooking spray and add 1 Tablespoon of batter to each muffin well. Bake 8-9 minutes until a toothpick inserted in the center comes out clean. Let cool in the muffin tin 5 minutes before transferring to a wire rack to cool completely. Recipe can make two 9 inch loaf pans as well. Bake at 350° F for 60 minutes. I’m excited to be joining some others in the food blogging community in this virtual Thanksgiving Potluck. You can follow all of the links to some delicious Thanksgiving dishes that we will be serving our families this year. 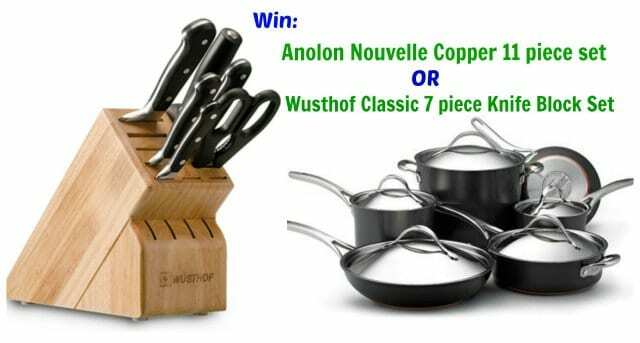 Also there is a chance to win an 11 piece Anolon Nouvelle Copper Set or a Wusthof Classic 7 Piece Knife Block Set. We are fortunate to have plenty in our family and I’m always looking for ways to teach our boys to think of others- especially around the holidays when it seems like everything we do is to excess. 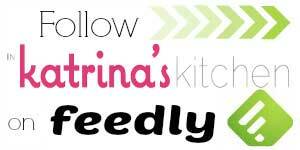 In Katrina’s Kitchen will be donating $1 for every comment left on this post to Feeding America. ($1 for every comment left on this post up to $200 through November 25, 2013) I realize that $1 might not seem like a lot but if we all come together we can provide a meal for a family in need. By leaving your comment here you are doing a small act that will make a big difference. 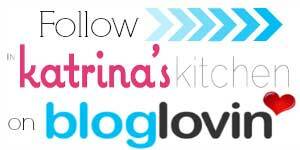 I would especially love to hear from you if you’re a reader of In Katrina’s Kitchen but maybe you’ve never commented before- now is your chance! Please use the giveaway entry form and leave a comment on this post to be entered. You will have the opportunity to earn bonus entries after you leave a comment. By entering this giveaway you are agreeing to the Official Rules. This giveaway is a sweepstakes. Open to continental USA residents over age 18. Winner(s) will be chosen by random, announced here, and will be contacted by email. Winner(s) must respond within 48 hours to claim the prize. Katrina! I’m LOVING those big giant chocolate chips in these. Amazing! And so good of you to donate for every comment! Such a great idea. I kind of love the giant dark chocolate pieces too. If I try to use anything else my family members revolt! These are so stinking cute! Love! Those giant chocolate chips?? *SWOON* Love these muffins! Swoon indeed! They are so good and chocolatey warm out of the oven. Thank you so much for participating! Your muffins look perfect, and you are bake in the kitchen (even if just in small amounts). Love what you are doing donating as well! Thank you for inviting me to be a part of this, Erin! 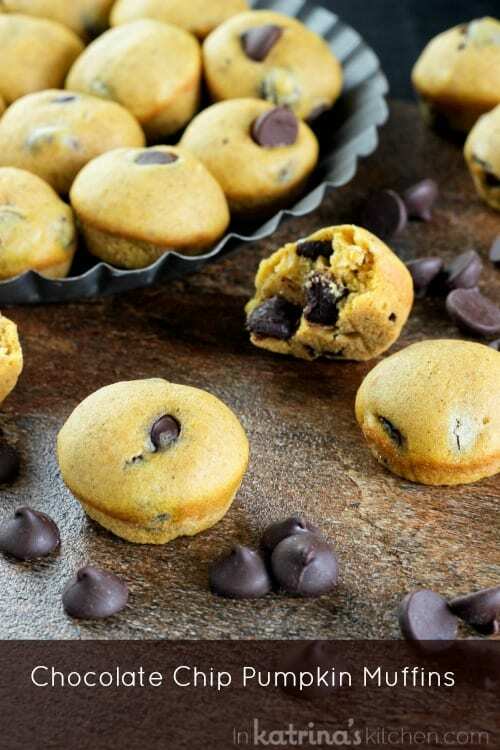 Mini muffins are the best, especially when they contain pumpkin and chocolate! What is is about pumpkin and chocolate that is just perfect?! I was so glad to participate in this potluck with you Carolyn. I would definitely go for the chocolate chip version first! Love the big chips in the little muffins!!! These pumpkin chic muffins look marvelous. I will give them a try. Thanks for your kind contribution on our behalf. Thanks Maggie. I hope that you love them as much as we do! Awesome. Will be making these for a bake sale on Thursday. Great idea! These are a perfectly big batch for a bake sale. Mini muffins were my kryptonite as a kid!! I couldn’t resist them, ever. These are definitely reigniting that love affair I had with them!! I know what you mean. You just keep coming back for ONE more! Nevermind that by the end of the day I’ve had eleventy hundred of them. Thank you for commenting Janet! It is such a hard thing to teach children to be compassionate but we must keep trying. 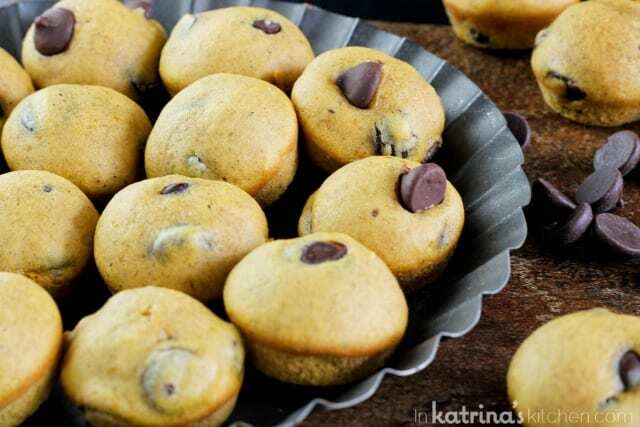 These little mini muffins are to die for, Katrina! 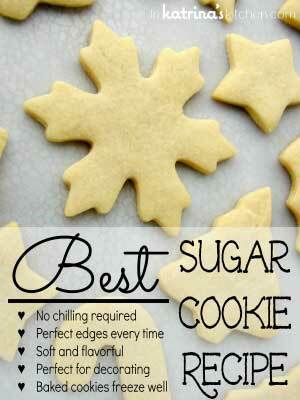 What a great flavor for the holidays, and a super easy recipe for Thanksgiving breakfast. So glad you shared these! Thanks Georgia! It is our favorite way to start Thanksgiving for sure. I almost laughed when I read your comment about needing to get this recipe on the blog so you have it documented–I have a pumpkin choc chip (with oat) muffin recipe that’s a favorite of ours, and I have to scramble to find it every time! What a fantastic commitment to Feeding America. Thanks for reminding us all to give back by setting a wonderful example! I can’t tell you how many times I’ve pulled up my blog for a recipe- lifesaver!! Okay maybe that’s a bit dramatic. But TIME SAVER for sure! Oh, yeah! My kids would be thrilled with your Thanksgiving morning tradition! Especially with the chocolate chips! No one has ever complained about the addition of dark chocolate 😉 Thanks for stopping by, Liz! Thanks Mom! Can’t wait to make up another batch next week!! You’re awesome to be donating $1 for each comment. 🙂 Go, Katrina! And I love those big, fat chips! It’s just a small part but I’m grateful to have enough to share. Thank YOU for commenting and sharing in this with me! Mmmm pumpkin choc/chip muffins. I have to make! There’s something about the chocolate/pumpkin combo that gets me every time! Thanks for stopping by! I love that these are mini! It makes the chocolate chips seem that much bigger. Need one of these muffins right now! I’ve made them in loaves, regular muffins, and mini but we always come back to mini- so much easier to munch on throughout the day! These look AMAZING!! I’ll be making them very soon! Awesome! Thanks Kandance- I’d love to know what you think of the recipe- our family favorite! Thank YOU for doing your part and joining in with me by commenting! Thank you Natalie! I’m glad you stopped by. Awesome idea to donate $1 per comment! Thanks for all you do for the cause. Great recipes and love that my comment results in a donation! The contests you have are awesome, too!!! Oh! 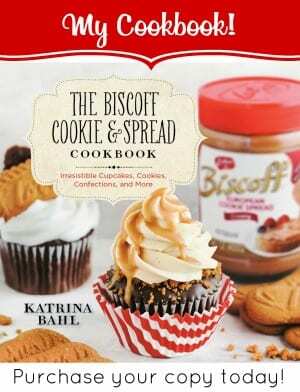 Thanks for this recipe…can’t wait to make it! I have the same problem. I lose paper all the time. I now have a system. As soon as I’ve perfected a recipe, I put it in my laptop. If I don’t, I’m sure to lose it. Katrina these look so good. I just want to reach into the screen and snag a few for breakfast. I lost my favourite cheesecake recipe so can totally relate to the need to document stuff. Thanks for being part of the solution to help others have food to feed their families! Thank YOU for doing your part and helping me by commenting. And thanks for reading! These definitely look super, duper yummy! Thanks for sharing and making a change! I can never resist these little guys! Thank you for stopping by and commenting! I love pumpkin anything, and these sound perfect for breakfast right now! They are tasty if I do say so myself 🙂 Thanks for stopping by and for sharing, Amy! Love mini muffins! I wish I was snacking on a couple now to get through this afternoon! This designer series Blendtec Blender is a chefs dream come true! Lovin’ muffins and this worthy cause…thanks! Thank you for partnering with me and commenting, Nini! Thanks for stopping by, Ashley! And I’m with you- I could never resist a mini muffin! Love anything with dark chocolate! Love anything with pumpkin or chocolate & the two combined is awesome . Can’t wait to try. Look forward to following your blog . I LOVE anything pumpkin! Why do we only eat it in the fall!!?? Lol thanks for the recipe. It’s on my to-make list! Oh my goodness! These look amazing!! I love pumpkin and when you add chocolate hello amazing! I can’t wait to try these!! I just need to go get a mini muffin pan! I have not had enough pumpkin things this year. That is a problem. Thank you for what you are doing in helping those in need and I am glad I get to help in a little way! Love your blog! Happy holidays! Everything is better with chocolate chips! I make a very similar muffin, but they come out a little more dense. 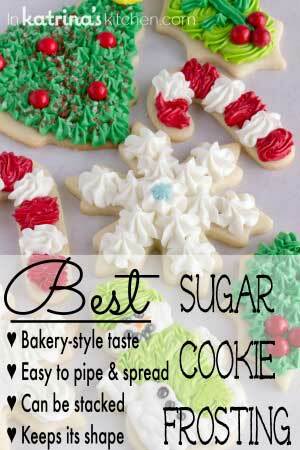 These look amazingly fluffy!